When I heard that MUA and beauty blogger Wayne Goss was working on his own set of brushes, I was definitely "watching this space". He shares my absolute obsession for brushes and I've agreed with most of his brush recommendations to-date. So when they launch-date arrived, saddo that I am, I had an alarm set on my phone to remind me to purchase as soon as they were released! These are not LE brushes, but they are handmade, and only a small number of them was available in the launch, as Mr Goss was completely funding their production and sale out of his own pocket (yep, that's right - this is really his "own" brush set, funded by himself, researched by himself - it's not his name to another brand). I think it paid off for him; the first round (product launch sales) was a complete sell-out. Sold through the ever fantastic love-makeup.co.uk, I decided to purchase three of the brushes to try out. According to marketing blurb, this is a "small, lightly pointed crease brush, designed for small eyes and perfect for creating a defined cut crease on any eye shape or size". 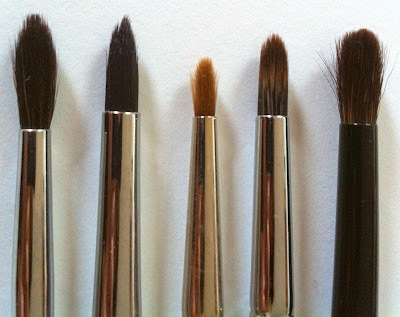 Wayne Goss recommends using for eyeshadow, in the crease area. For contouring the nose. For highlighting. For under eye bags/circles, and for blending. What I found what that I could have (personally) done without this one - first off, the 05 is more "rounded" or "domed" than "lightly pointed". I've mainly been liking it for highlighting underneath my brow, for adding a dot of highlighter to my inner eye, and for some smooshing-out of colour underneath the eye - but if I'm honest, nothing I really needed another brush for. It's a little too small and a little too dense and a little too firm for blending, for me personally. Look here for more info if you're interested. Again, marketing info informs that this is a "lightly pointed crease brush, designed for depositing and blending through the crease and creating a quick wash of colour. Its size makes it ideal for contouring the nose, highlighting and precision powdering". Wayne Goss's recommended usage for this is for eyeshadow, in the crease, for contouring the nose, for highlighting, for under eye bags/circles, for precision powdering and for blending. 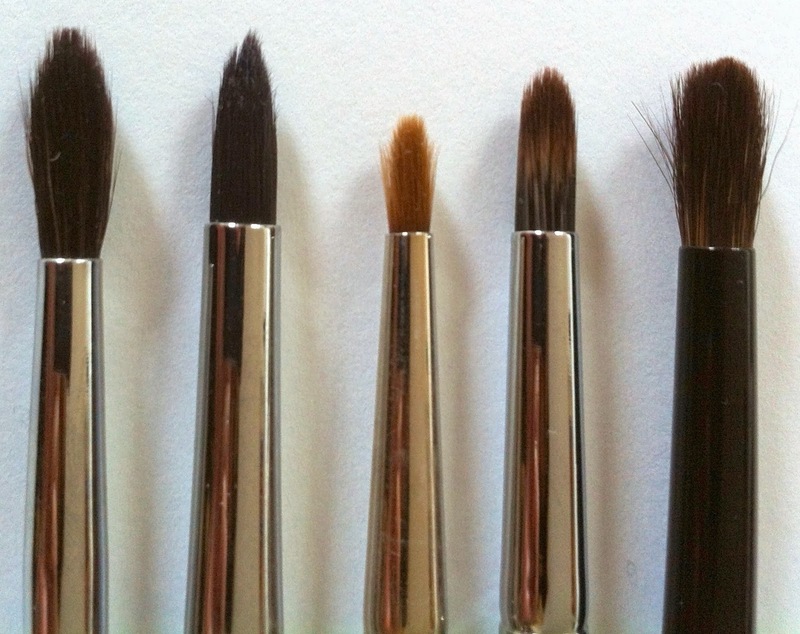 First off, the difference between the sizes of the small crease brush (05) and large crease brush (03) is immense (I would be curious to see how the medium crease brush (04) sizes-up). And neither are they the same shape, although the PR images and blurb suggests that they're both "lightly pointed", mop-shape brushes. Whereas the 05, as mentioned, is definitely rounded, the 03 is in fact "lightly pointed" in the same vein as the MAC 226, the Laura Mercier Pony Tail, the Louise Young LY38 and the Cozette S175. The 03 is slightly firmer than all of these, and leagues softer than them all to boot, and I can see it being a great alternative option (better, if you prefer a firmer brush) to the Laura Mercier Pony Tail brush, which is far more expensive and not quite as soft. 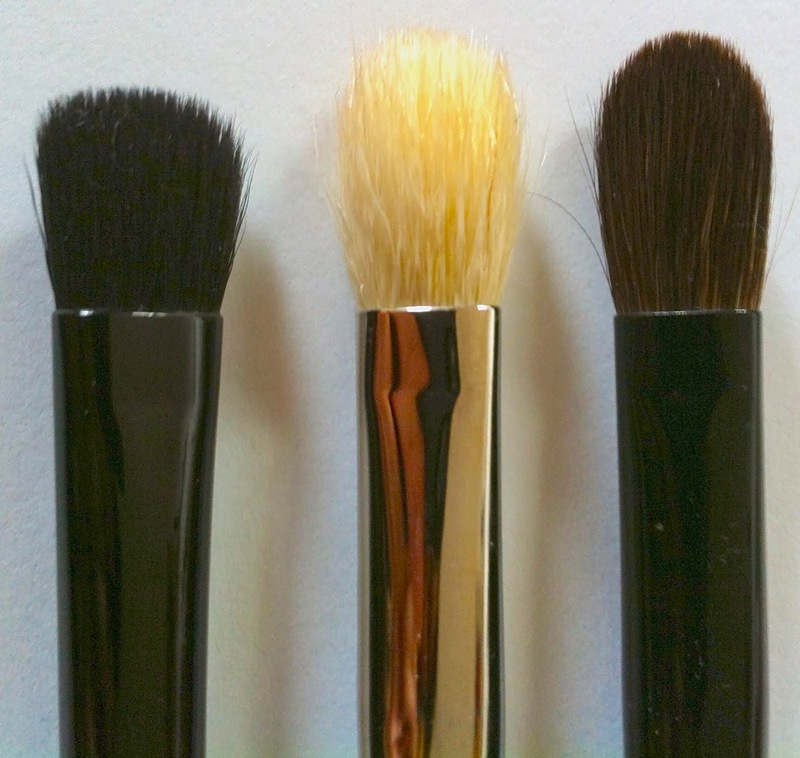 This one is a "lightly rounded blending brush perfectly shaped to take you from subtle wash of colour to smokey with ease" and it's suggested by Wayne Goss that you can use this for eyeshadow, the crease area, contouring, highlighting and blending, along with for concealer application and powdering. Probably my favourite of the three, it's a dense rounded paddle brush. Imagine taking a MAC 217, making the fibres far softer, a tiny smidge longer, more rounded at the tip, and more paddle-shaped overall. Although frankly I don't like to use it for blending, it could be put to this use. It's a great brush for getting a base on quickly and is suitably narrow on its side for working underneath the eye, or in the crease. Thus far it has kept its shape far better than something like the 217, but I'm hesitant to note this as they really are two different brushes (this one is far superior). So what makes them different? These are cruelty-free brushes, but unlike most brushes that make this claim, they are not synthetic fibres, rather they are made with natural fibres which are ethically farmed with no harm coming to the animals which provide the hairs. They claim to be silky-soft, and they are. Silky, in fact, is a really good description of these. Not in the same league as Suqqu, but I would certainly put them in the same category as the Hakuhodo J-series brushes in the softness index, and above the J-series in the silkiness index :-) In terms of pricing, they're around the same price as the Hakuhodo brushes to boot. Where they differ is that they're slightly more firm than the Hakuhodo brushes of similar shape/design. How did they wash? Well enough - they have maintained their shape and their silkiness after a couple of washes thus far, with only a very tiny amount of splaying. If I was to be really really picky, I'd prefer a longer brush handle. But that's a matter of personal preference. If you follow Wayne Goss on YouTube, it's very apparent that these brushes represent his personal preferences in terms of shape. 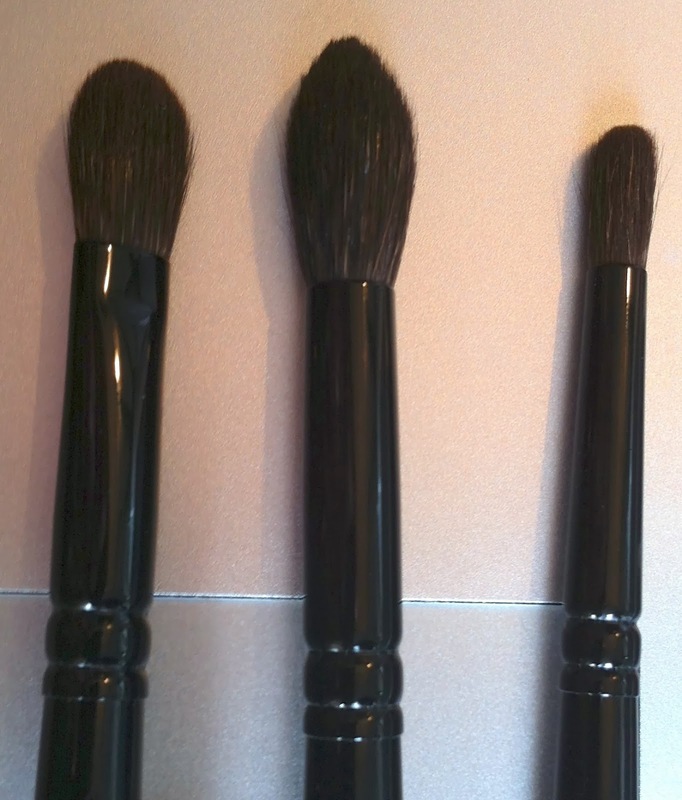 As far as the remainder of the brushes go - I would expect that they're equally silky soft as the three I have. I wasn't interested in Brush 01 (it's too similar to a Shiseido brush I already own). 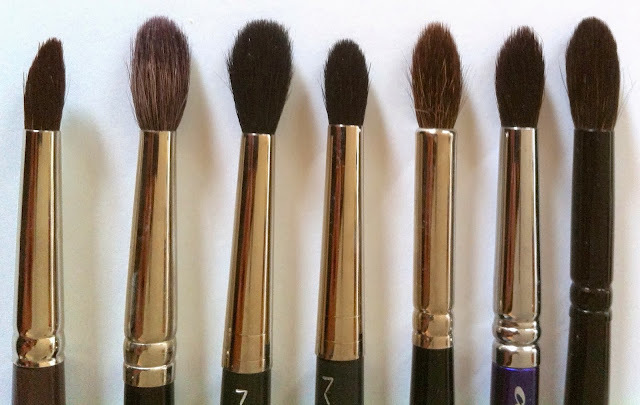 For me, Brush 02 looks too similar to the MAC 165's I already have (but as the 165 was an LE brush and is discontinued, Wayne Goss's version would likely be a fantastic one to get for highlighter, contouring, blusher, powder, if you don't have this shape brush already). As far as Brush 07 goes, I have plenty of lipbrushes already (I wasn't surprised to see it's a small lip brush though, I think Wayne Goss favours smaller lip brushes in general). 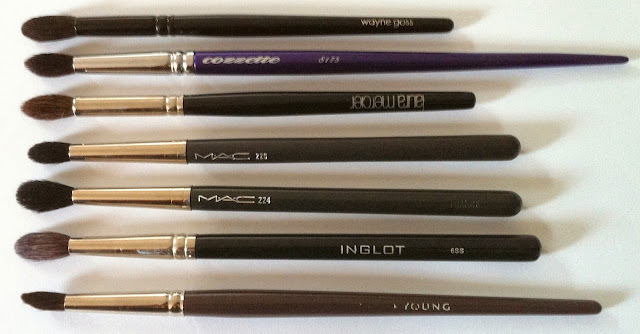 Similarly, with respect to Brush 08 - a push liner brush - I have a bunch of push-liners and they're not something I reach for particularly often. I was surprised to note the lack of a standard liner brush, until I remembered that he tends to favour push liner brushes in general, or at least seems to from his YouTube videos. Would I recommend? Yes. Of the three I purchased for review, I would recommend the 03 (only if you don't have a pointed crease brush) and the 06 (just because it's a great shape and there's not much else out there that's similar). They're at least worth a look when they're back available again and their price-point makes them extremely affordable for what are seriously much better than just average good brushes.